As I've mentioned before, I've been eating a lot of beans during my detox, all of which have been cooked from the dried stuff. It's so convenient and easy to reach into your pantry for a can of beans, but there is still a small amount of additives that go into the cans to help aid in a longer shelf life. Cooking dried beans is honestly not hard. The thing to remember is to soak your beans the night before you want to use them. Once you have that done, it gets easy. Just add the drained, rehydrated beans to a pot of salted boiling water, along with any other aromatics you may wish to use (garlic, herbs, bay leaf, or just plain) and simmer for at least an hour, or until tender. Drain, rinse and keep refrigerated until ready to use. The original recipe called for chickpeas but I ended up using romano. 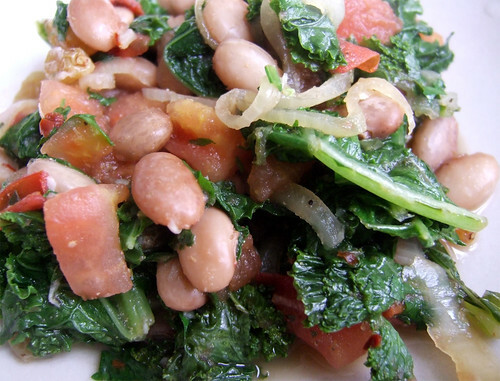 Use whatever beans you prefer, whether they are chickpeas, romano or white kidney beans. 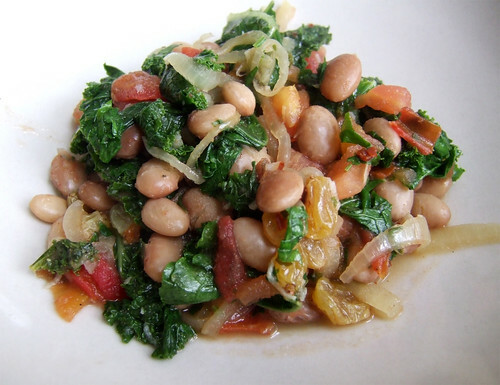 Beans and greens are such a classic combination, and this dish is so comforting. The added kick from the chilli flakes and the sweetness from the raisins add a nice touch! If you're ever in need for some vegetarian inspirations, definitely pick up Fresh & Fast Vegetarian by Marie Simmons. There are tons of fabulous recipes in the cookbook that are fast and easy to make, but also delicious. Heat 3 tablespoons of the oil and the onion in a large skillet over medium-low heat, stirring, until the onion is limp and golden, about 10 minutes. While the onion is cooking, pull the leafy parts of the kale or chard away from the ribs and tear the leaves into 2-inch pieces. Discard the ribs. Rinse the leaves in a big bowl of water and place in a colander to drain. Add the beans, garlic, cumin, salt, chilli flakes and a generous grinding of black pepper to the onion and cook, stirring, over medium-low heat until heated through, about 5 minutes. Add 1/2 cup water and the kale or chard, tomato and raisins, if using, and cook, covered, over medium-low heat, stirring once or twice, until wilted and tender, 5 to 10 minutes for kale and 5 minutes for chard. Stir in the parsley, remove from heat and sprinkle with lemon juice. Serve immediately with rice, couscous or quinoa.